A monument and beacon of light for the new Tahoe-Reno Industrial Center, the largest technological industrial park in the United States, home of the new Tesla Gigafactory 1. It is a hopeful and futuristic gateway, literally and symbolically filled with light. Transition Portal is intended to illustrate the transformational path of human evolution towards a sustainable future. To learn about the meaning of sculptures' symbols, please scroll below. Sunsert through Transition Portal. Photo by Ryalnd West. 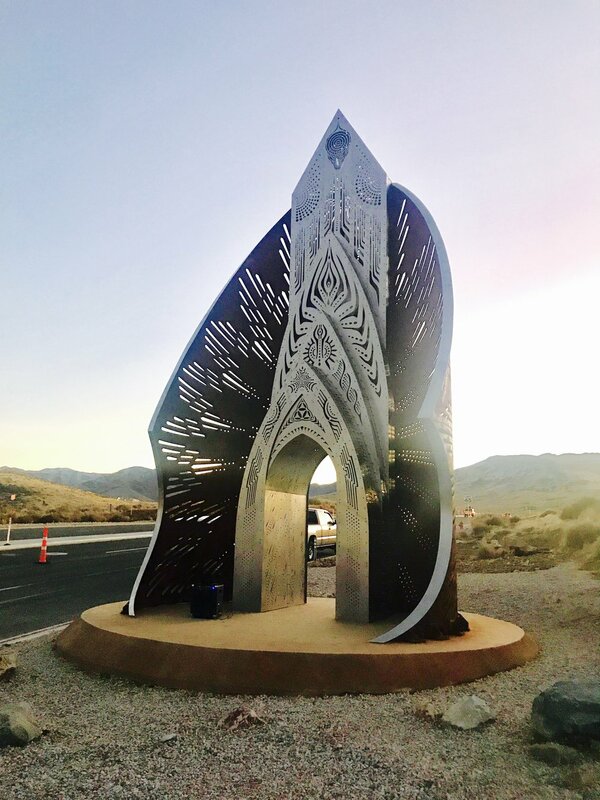 Transition Portal is a sculpture about humanity's path of evolution. The central steel modern doorways emerge out of the embrace of the past and present, symbolized by the huge weathered steel wings that represent being held by the Earth. The cuts on the steel represent the patterns of Nevada’s mining industry: the scraping marks of the backhoes and terraces as humans dig for natural resources. These cuts are laid out in a dynamic, expansive radial pattern, where the design radiates from a central point from the back doorway. This is a reminder to all of us that whatever we humans do, everything we have comes from one source: our Earth. That is our true source code. The largest top arch represents consciousness, the cosmos, orbits of planets and the laws of physics like gravitational fields and electromagnetism. The next arch represents our physical earth: the waves and particles of matter that make up the tangible curves of our mountains, waters, wind and fire that are the elements of our planet. The next archway represents humanity: our common DNA that bonds all of us as one people, and the cave paintings we created as the first way we communicated to each other in symbols. The next archway represents technology: the particles of information, the circuitry, the satellite and wireless signals that transmit this new shared intelligence. The final complex triangle symbol I created as the keystone represents the harmony that needs to be created throughout these 4 levels of existence, where our consciousness, our earth, our humanity and our evolving technology is held in balance. 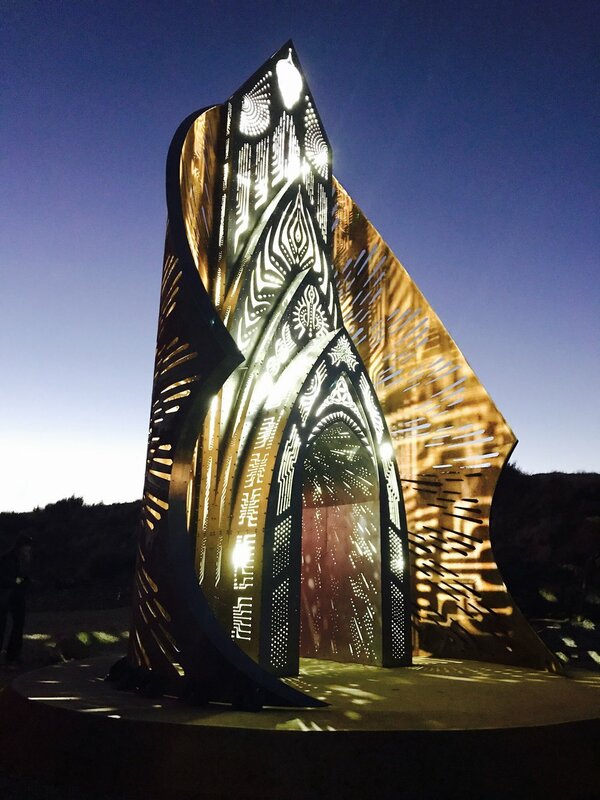 The doorway patterns as you walk through the portal (especially at night when it is illuminated) represent hyper-space travel through stars, and the upward forward motion towards the future that lies ahead of us. The exploding star pattern on the back side of the doorway's peak represents the “big bang” that started this beautiful mystery we call life.